It has been pretty quiet here lately. 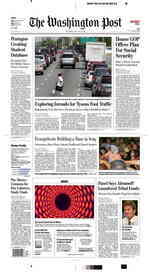 I have been transitioning between my old job, as photo editor for The Washington Post Magazine and my new job, as Picture Editor for The Washington Post newspaper. My staff has exploded from 1 to over 40 (including 5 Pulitzer prize winners) and my mandate includes trying to stop the slide of readers away from newspapers by re-introducing them to consistently great daily photography. Yesterday was my first full day in the new gig; it was a slow day, thankfully, but I know that won't last. I am looking forward to the challenge - and after helping the news move to the web (as Photography Director of washingtonpost.com and AOL back in the mid-ninties), I get to return the favor and help keep the news interesting and relevant in print. New Design Ideas At Work. 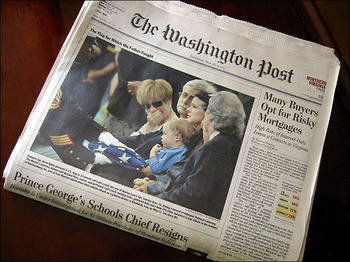 Today's Washington Post features a tough, emotional Memorial Day story on the front, above the fold. The article, introduced with a wonderfully poignant photograph by Andrea Bruce Woodall, is from the Metro section, however; the lead photo for A1 serving as a key to a different section's main story. A great design concept is at work here; namely leading the paper with the best photograph, regardless of where the story ultimately resides, and letting that provide the entrance point to the rest of the content. Wow! What I have been doing for the last week is finally online. The winners of this year's Best of Photojournalism contest are all posted on the National Press Photographers Association website. 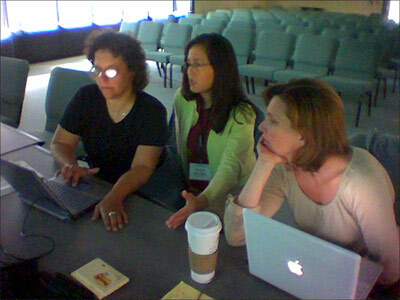 I coordinated the web competition and had a great bunch of judges; Mindy, Cheryl and Anne. 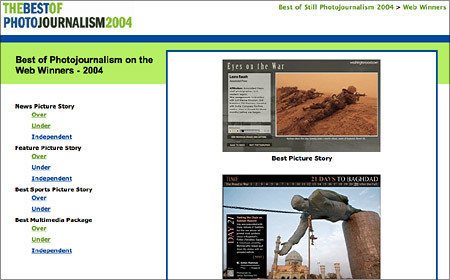 Update - Web Judge Cheryl Diaz Meyer is the winner (along with David Leeson) of the 2004 Pulitzer Prize for Breaking News Photography! I spent a very contentious last week at work with some non-visually literate editors unable to grasp the meaning of photographs shot for a "fantasy" holiday party story they commissioned. The photos, taken by Josef Astor, beautifully track and interpret the writer's notes from a meeting of the party planners, right down to the "Dr. Seuss" tunnel through which party guests are to arrive. So what's the problem? Its the missing link; the thing that makes it possible for one group of people - artists - to take and make ideas real by breathing life and form into them. These guys don't have that. As anyone involved in the creative life knows, too often those charged (or self-appointed) with being the gate keepers - editors - have never been creators - artists - and don't speak or understand the language. What we have here is failure to communicate. Let's see if we fair any better this week. I spent the better part of last week, including the weekend, working on a photo shoot for the Post Magazine's Holiday Issue. One thing that helped make it positive, despite the chaos, was the great work of photographer Josef Astor and his crew. They were amazing reconstructing the Dr. Seuss Fantasy Party that never was. Being out of the office also gave me a chance to get more familiar with textamerica, where I have a moblog for my Sanyo 8100 (on the Sprint network). I have been using a Sidekick for about a year now, but I really, really like how easy the 8100 is; open it, press the camera button twice, and your in picture-taking mode. No external camera to pull out or lose. On this occasion, it was a great way to update my editors back in the office! This has been a hella tough week! As anyone in the magazine publishing industry knows - fall is the season. This is the time when you have big pages, run 'important' articles AND make most of your money. Our tiny rag is no different. So my brief time out of the office this week, on a research project, was supposed to further the no time-lots-to-do agenda, nothing more. Boy was I surprised when I stumbled on one of the largest, least known photo collections in the whole world! It turns out that the Smithsonian's Museum of American History - as eclectic as the nation itself - houses the very first museum collection of photography in the U.S., started in 1896. Since then, in the name of history, of course, they have collected everything and anything to do with photography they could get their hands on. In a brief 3 hour period I saw 140 photographs by Erich Salomon, the German photographer who was the first to adopt the Leica and is cited as a major influence by Cartier-Bresson (this is what I was looking for); turn of the century Egypt by Francis Frith; prints from Diane Arbus (that she did herself), a collection of weird and wacky Polaroid cameras; a 'secret' portfolio by a rather famous photographer that I am not allowed to talk about, and some rather cool stereo daguerrotypes. WOW!!! Who knew? This made my day and week - hope to visit explore again soon!!! Just up, my first Typepad photo album! Its a look at the Washington Post Mag Fall Fashion shoot from last week. other than the stated criteria (like file name). Oh well, we are still in beta! Nikon has a new flagship camera, the D2H. Not much news on the photo front, but this camera sports an add-on wi-fi module allowing it to transmit (via FTP) to a server as it is taking pics! Long distance, real-time editing is truly at hand as virtually every 'big' event is wired for journalists to transmit stories and pics back to the office. Now all you need do is attach a wi-fi router to the broadband link and let the camera's built-in FTP software do the rest! Can a Canon version be far behind? As previously noted, I spent most of last week dealing with the start of our busy season at the mag - 1st up, Fall Fashion!!! Logistics are always the make or break; this time we chose to shoot in Georgetown and made the new Ritz-Carlton our home for 2 days. They did a great job providing 'atmosphere' despite our being surrounded by Secret Service agents preparing for the arrival of the new Palestinian Prime Minister, Abbas. Our models were WONDERFUL!!! Viola (the blond) talked politics and Francesca (the brunette) played piano (see quickvid below) in between shots. Otherwise they just looked great for photographer Ericka McConnell's camera.